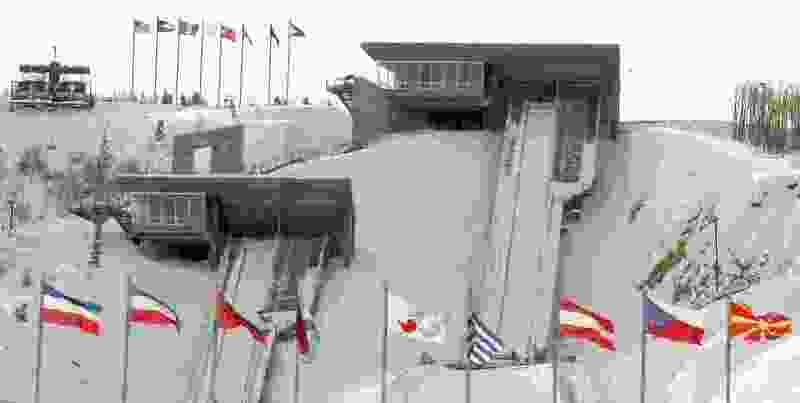 Steve Griffin | The Salt Lake Tribune Flags from nations around the world blow in the wind as the frame the ski jumps at the Utah Olympic Park in Park City Jan. 7, 2005. Derek Parra feels the spirit every day. It hasn’t waned one bit, according to the Olympic gold medalist from the 2002 Games in Salt Lake City. Parra sees it in the youth speedskating sessions he’s watched, the recreational hockey games he’s walked by and the laps taken by current Olympic hopefuls inside the Utah Olympic Oval in Kearns. “I believe it’s still here,” Parra said. The 47-year-old gold medalist turned sport director at the Olympic Oval is the embodiment of the state’s Olympic legacy, a southern California transplant who, after reaching the pinnacle of his career, decided to relocate to Utah and keep the legacy pressing forward. His days are spent in the same building where he stood atop a podium, saw the American flag raised high and heard the national anthem as an Olympic champion. Before that, Parra carried the flag from the World Trade Center in the Opening Ceremony. Momentum is strengthening behind a possible return of the Olympics, 15 years after Salt Lake City first welcomed the world to its peaks and valleys. An Olympic Exploratory Committee (OEC) was announced this week that features political leaders, community voices and former Olympians tasked with determining whether another winter games could be economically feasible. A report is expected to be delivered to the Legislature by Feb. 1, 2018. Another vital step in researching a potential bid was taken this week, too. A legislative audit of the Utah Olympic Legacy Foundation (UOLF) was released Tuesday, revealing that the nonprofit organization successfully has kept three Olympic venues operating on an annual basis since the conclusion of the 2002 Winter Games. Legislative auditors, however, suggested investing close to $40 million in public funds within the next 10 years to upgrade them. The UOLF operates the Olympic Oval, the Utah Olympic Park in Park City and the Soldier Hollow Nordic Center in Midway. The upgrades, the audit states, are necessary to ensure proper safety standards are met within the next decade. According to the audit, usage has increased at the Olympic Oval (42 percent) and Olympic Park (12 percent) since 2013. The number of competitions at the venues also have increased by 50 percent. Foundation president and CEO Colin Hilton said this is the first time the state has done a performance audit on the UOLF. The foundation performs annual independent financial audits, and an independent performance audit has been done every five years since 2002. Hilton is one of nine officials to serve on the OEC. He said part of his job in this exploratory process is reaching out to other facilities and adjacent venue communities in Utah that hosted events in the 2002 Games to see if they’d be interested in another crack at hosting if Salt Lake landed another Games. “The desire, if you will, is to have Utah be able to help showcase the benefit of returning to existing Olympic facilities that have been maintained and are busier than where we left them off right after the first Games,” Hilton said. The legislative audit suggested a $5 million upgrade to the bobsled track retaining walls at the Olympic Park and another $2.3 million in new asphalt and guardrails in the canyon above Park City. The Oval is in need of a roof replacement, which is estimated to cost $1.75 million and a new boiler and chiller replacement at the Oval could cost just over $1 million. Soldier Hollow’s estimated costs in upgrades (new water system and snow-making machines) hover just below $1 million. At Thursday’s OEC news conference, Utah House Speaker Greg Hughes dubbed the upgrades at the various foundation facilities “anyway costs.” The estimated $40 million is a number the state will prioritize, Hughes said. Hughes said the state needs to accelerate the process of upgrading the facilities in the suggested 10-year time frame with the uncertainty of another potential bid hanging in the balance. “It’s something we would be crazy not to do,” he said. An estimated $39.3 million is needed in upgrades to Utah’s Olympic venues over the next 10 years. Here are some of the bigger-ticket items, according to a Utah legislative audit. Utah Senate President Wayne Niederhauser, who is one of three co-chairs on the OEC board, said he doesn’t expect the $40 million to be repaid should Salt Lake host another Games. “It’s important to our brand here in Utah that we are the place of winter sports, and we can keep that up,” said Niederhauser, who added an estimated 60 percent of U.S. Winter Olympians live and train in Utah. Another Olympics undoubtedly would strengthen the future of the foundation. Rep. Brian S. King, who sits on the legislative management committee’s audit subcommittee, said he was struck by the extensive information shared in the foundation’s audit released Tuesday. But King said while the audit was an important first step, he believes more information on the economic impact and how a bid would affect state taxpayers in the coming years is crucial. After reading through the audit, Parra came away feeling better about a potential Olympics redux than before.